There are three published versions of which I’m presently aware regarding Arrowhead Ranch and journalists from the Investigative Reporters & Editors (IRE) Arizona Project following the fatal June 1976 car-bombing of Phoenix reporter Don Bolles. And none of these versions, I’m sorry to say, is entirely accurate. The first appeared as one of a series of 23 articles released by the Arizona Project in the spring of 1977. A second then appeared later that same year in DETROIT NEWS reporter Mike Wendland’s “unauthorized” volume about the Arizona Project, written in violation of a supposed understanding by all of us involved in the project not to do so individually. The original plan called for an “authorized” book later to be released to assist in covering subsequent legal expenses of anticipated lawsuits, a plan sadly negated by Wendland’s bootlegged publication. And a third version just appeared in a Spring 2015 issue of THE IRE JOURNAL in an article by Kasia Kovacs reminiscing about the Arizona Project, a piece drawing heavily concerning Arrowhead Ranch on the memory of project member Harry Jones, then of the KANSAS CITY STAR. A representation of a Mexican American field hand carrying a red flag alongside a large onion farm in western Maricopa County in the fall of 1977. 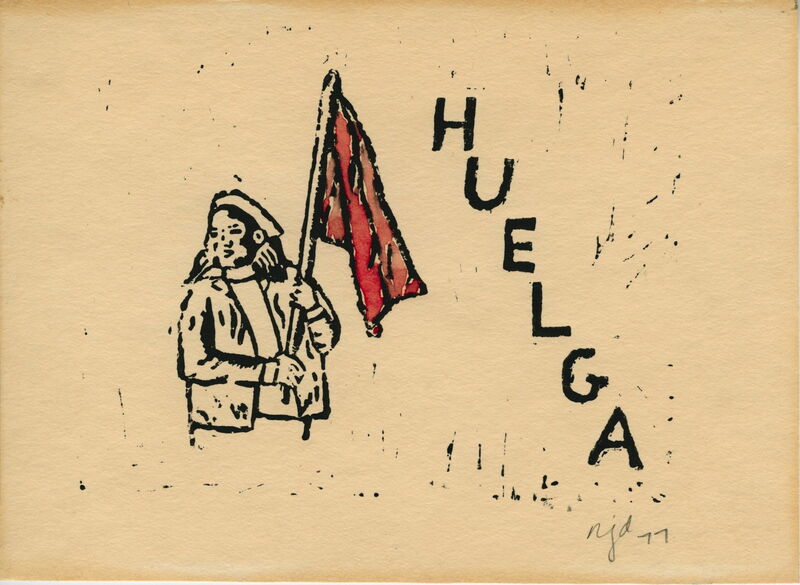 “HUELGA,” of course, is a Spanish word for “STRIKE.” (Linoleum block print by Niomi Devereux) Click on the image for a full size view. The Arizona Project’s own article on the subject at least does mention that the reporters had an unnamed “guide” in their penetration of considerable Arrowhead Ranch security to find scattered camps of badly mistreated, undocumented Mexican National workers among several thousand acres of dense citrus groves. And Wendland’s book does accurately identify that guide as Lupe Sanchez, then employed by a local legal aid office. But Wendland misrepresents both how Arrowhead Ranch first came up as a possible project target and how Lupe actually got conscripted to provide crucial assistance. In the recent journal article, Jones also presents an incorrect explanation of how the ranch came to the attention of the Arizona Project, neglecting as well to offer any mention of Lupe’s very essential services. To explain what really happened, I need to start in the early 1970s when, for an independent publication called the NEW MEXICO REVIEW, researcher Steve Goldin and I began to investigate a newly launched land development on 99-year-leased Indian land just north of Santa Fe where we then were based. As a project of the Sangre de Cristo Development Corp., it was called Colonias de Santa Fe. It had a distinctly bad odor from the start, including the unwelcome aroma of some serious environmental issues, and its general manager happened to have his principal development office in Phoenix, Arizona. Doing an investigation not only required our own periodic research trips to Phoenix. It also required getting some help from other journalists in the Phoenix area who already knew much more than we did about Arizona-based land scams. The first of these was a creative researcher named David Leuser who then published an alternative weekly in Phoenix called VOICE OF THE CITY. He proved to be of very substantial assistance in finding crucial business documents for us. And the second, also quite supportive, was Don Bolles of the ARIZONA REPUBLIC. Between these two, augmenting our own work, we eventually were able to confirm a significant grip on Colonias de Santa Fe through secretive subcontracts by Phoenix-based organized crime figure Ned Warren, then the ruling kingpin of land fraud in Arizona. Once that was published and publicized, and given justified tribal expressions of concern, an embarrassed U.S. Department of Interior immediately stepped in to cancel the lease of Indian land and to terminate the project. When Bolles subsequently was murdered in June 1976, Steve and I felt compelled to join the emerging IRE Arizona Project. Our participation in that effort, given our already established activist credentials in New Mexico with such prominent national contacts as W. H. “Ping” Ferry and David Hunter, also made possible a range of financial support from progressive foundations and funding sources which otherwise might not have occurred. In the run-up to the Arizona Project, before NEWDAY editor Bob Greene had yet even to reach Phoenix to direct the effort, we already had arranged with him and no less investigative journalism icon Tom Renner to be coming from Santa Fe, bringing with us our own extensive files on organized crime in the region. This included information which Steve and I had acquired about mob connections with a giant citrus farm just west of Phoenix called Arrowhead Ranch, historically linking organized crime folks from Chicago and later Detroit to control of the place. By the 1970s it had become owned by a partnership called Goldmar involving the Phoenix-based Martori and Goldwater clans, the latter nominally represented by then important local banker Bob Goldwater, brother of the more famous Barry Goldwater. We also had learned through an article published by Leuser in VOICE OF THE CITY in the early 1970s about the ongoing exploitation and abuse of undocumented citrus workers at Arrowhead Ranch. And early on we alerted Greene to the issues at the farm, obviously made especially notable by its then current ties to the Goldwaters. 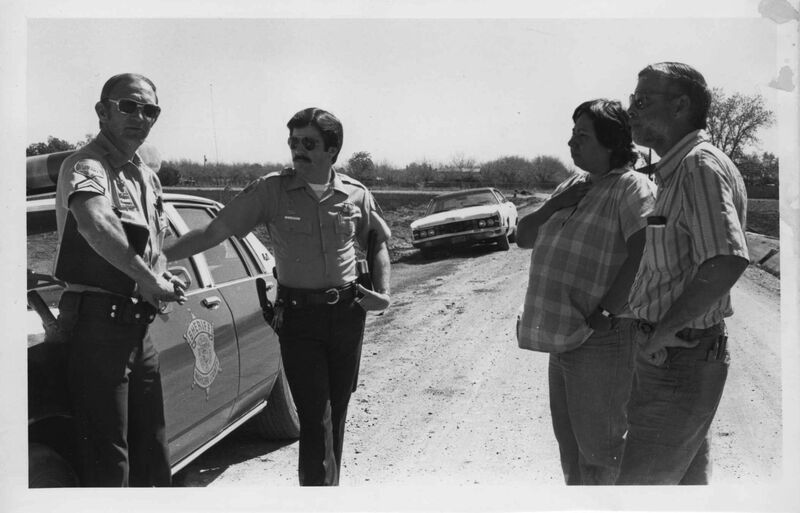 Don Devereux at right with MCOP organizer Adela Serrano negotiating strike line rules of the day with Maricopa County sheriff’s deputies at the site of a prolonged work-stoppage at an onion farm in the fall of 1977. (Photographer unknown.) Click on the image for an enlarged view. Greene in turn asked me if I could find someone to serve both as guide and interpreter as necessary to enable access to undocumented Mexican National farmhands on that property. In complying, I made another trip to Arizona in the late summer of 1976 to talk to old friend Gustavo Gutierrez in Tempe and to seek his help. Gus had worked with Cesar Chavez and the United Farm Workers (UFW) in Arizona until the UFW pulled out of the state in the early 1970s when a newly adopted Arizona State Farm Labor Law made union organizing virtually illegal. Gus, in fact, was actually the unidentified farm union figure cited in the current article in THE IRE JOURNAL asking Barry Goldwater in 1972 about his brother Bob’s employment practices at Arrowhead Ranch. As the patriarch of those with concerns about Arizona farm labor, Gus knew just about everyone interested in that issue. To help the Arizona Project, in response to my query, he arranged for a younger and very dynamic ex-UFW organizer named Lupe Sanchez, already familiar with the geography of Arrowhead Ranch and some of its workers, to be available as a guide/interpreter as needed. And I duly relayed Lupe’s name and contact information to Greene, with Lupe ultimately to play an important role. This tale really doesn’t end there. As quid pro quo for his help, Lupe had asked me to relocate from Santa Fe to Phoenix when the Arizona Project was concluded in order to assist him in setting up a renewed farm labor organizing effort in Arizona, one not dependent on the UFW and its California preoccupations. Seeing both its importance and its unique challenge in the face of the obstructive Arizona State Farm Labor Law, I agreed to do so, moving with my family to Phoenix in 1977. Lupe and I already had formed a non-profit civil rights entity called the Maricopa County Organizing Project (MCOP). I assumed administrative and fund raising responsibilities, and Lupe was in charge of all field organizing, on the Mexican side of the border as well as in Arizona. Steve Goldin remained in Santa Fe where, through a previously established nonprofit group there with already approved 501(c) (3) tax-exempt status, he thereafter served as fiscal agent for MCOP and a few other related non-profits later to be spun-off in Arizona. Because MCOP was a civil rights organization instead of a union, we effectively fell outside the reach of the Arizona State Farm Labor Law, much to the dismay of local growers. And our first strike began October 3, 1977, right at Arrowhead Ranch, ostensibly the most powerful farm in the state because of the Goldwater connection. We conspicuously weren’t seeking union recognition, just asking instead for compliance with such civil rights issues as federal minimum wage requirements and improvements in worker health and safety matters involving pesticides, etc. In so doing, we actually made U.S. labor history. This was the first large-scale strike by an entirely undocumented work force, about 300 strong, that had ever happened in this country. To the consternation of INS and ranch management, despite many predictable arrests and deportations in days that followed, the strike still managed to hold with Arrowhead Ranch eventually agreeing to terms on October 25, 1977, pushed additionally by massive amounts of local press and TV news coverage of the deplorable working conditions — no housing, contaminated water, unnecessary pesticide exposure, no medical care, and no minimum wage enforcement. Not willing to risk continuing negative publicity, the Goldwaters also quickly arranged to be bought out by their Martori partners. Arrowhead Ranch manager Art Martori frankly had inherited a very bad situation from his late father Joe Martori. And after a number of other periodic work stoppages over additional civil rights issues, Art Martori finally decided in January 1979 that the time had come to stabilize production by seeking a binding longterm agreement with his work force and, in the process, to bring his citrus groves into the 20th century. Apart from being a skilled agribusiness manager, he proved himself to be a decent human being as well. A binding longterm agreement, of course, is called a contract. And at that point the Arizona Farm Workers Union (AFW) came into being in order to house it. An initial two-year deal with Arrowhead Ranch was completed, a good one providing seniority, housing, a meal plan, safe drinking water, basic health care, and a very acceptable wage structure. This also made further U.S. labor history, the first union contract in this country covering an entirely undocumented work force. Lupe then became head of the AFW, with me as the union’s press secretary, while I also continued to administer MCOP activities elsewhere. Along the way, we also organized thousands of farmworkers, mostly Mexican American families, toiling at a number of large onion farms in western Maricopa County, sometimes involving importune child labor, in their fight for better wages and working conditions. In so doing, we formed a farmworker service center called Centro Adelante Campesino and a storefront medical facility called Clinica Adelante. Through another entity known as the Farmworker Economic Development Corp. (FEDC), we also generated monies and tangible resources to be made available to Mexican National home-base areas south of the border via yet another organization, the Cooperativa Sin Fronteras, headquartered in the Mexican city of Queretaro. All in all, blessed with extraordinarily dedicated and talented staff, it had become a sizable complex of activities. In the wake of the January 1979 AFW/Arrowhead Ranch contract, soon leading to a few other citrus farms under contract as well, my own life became even more complicated. In the spring of that year I finally bowed to pressure from SCOTTSDALE PROGRESS publisher Jonathan Marshall to begin working concurrently as an investigative reporter for that daily suburban newspaper. The topic would be the official probe and prosecutions in the Don Bolles homicide case. Marshall suspected a critical mishandling of that case, one which ignored most of those truly guilty at the expense of a tragic miscarriage of justice for a few others. And, as subsequent information and events have shown, Marshall indeed was right. But for some years beginning in 1979 I found myself busily getting to know all too well the roads back and forth between a farm labor office in El Mirage on the west side of Phoenix and a newspaper office in Scottsdale on the east side. Just a decade after our 1976 beginnings, much of this expansive farm labor activity — MCOP, AFW, and FEDC in particular — suddenly came to a halt. In 1986 the large farms which we had organized in Maricopa County west of Phoenix, far sooner than we ever had anticipated, unhappily were being sold to be converted into subdivisions as urban sprawl inexorably had its way. In that same year, the federal Simpson-Rodino immigration reform bill was passed, signed, and adopted in Washington, D.C., happily making many of the AFW’s members who were undocumented eligible for legal status … and for U.S. construction and other urban jobs. In effect, farmworkers at Arrowhead Ranch could become the builders and grounds-keepers of extensive Arrowhead housing developments, an Arrowhead Mall, and even a local golf course or two. At the same time, the UFW announced its intentions to come back into Arizona, a false promise as it worked out, but we accepted it at the time as an alternative to having to start all over again in some other part of the state. Some of our undertakings have survived of course, with Clinica Adelante, for example, even having grown into a considerable number of rural and urban-fringe out-patient facilities around central Arizona, still serving a largely low income Hispanic population with a sliding fee scale. It now functions under the banner of Adelante Healthcare. And in rural Mexico, agricultural cooperatives which we organized, water and irrigation systems which we made possible, and schools which we built are still in business. Perhaps something in this overall mix now should be dedicated to the memory of Don Bolles. In a strange way, his violent and untimely death actually has led to an array of unexpected but progressive social actions and accomplishments of which, knowing his approach to life, I’m confident that he would have approved. As often has been observed, bad acts sometimes can produce consequences still to be celebrated. are you still interested in Galvin murders..Evanston Il?? Yes. I sent you an email with my phone number. Call me at your convenience. This is so fascinating to me. My parents have recently moved to Arrowhead and a neighbor mentioned the Bob Goldwater connection. But this is … wow!